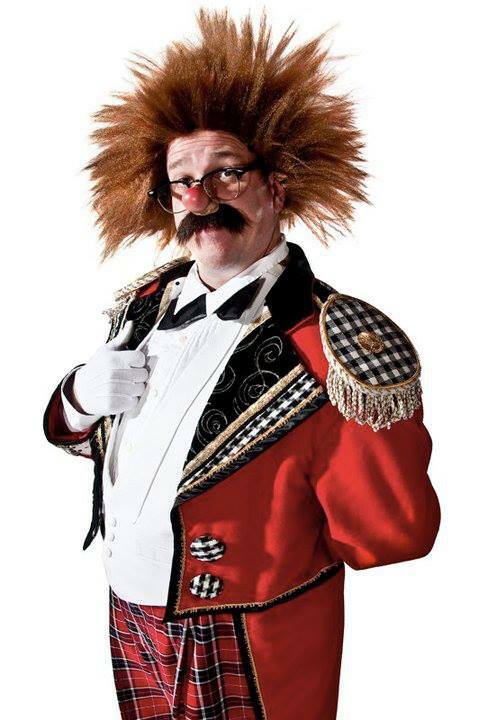 Rudy Coby "The Coolest Magician on Earth" performing the Multi-Leg Gag I enjoy Jeff "Le Clown Gordoon" Gordon's version very much but I think my favorite is Geoff Hoyle's. 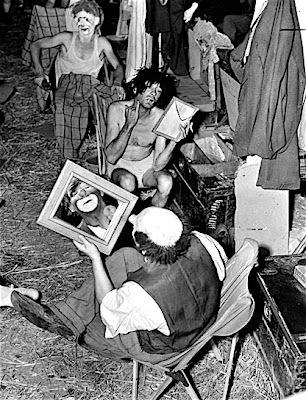 Otto in the Cole Bros. Clown Alley, September 21, 1937. Apparently, back in the late 30s Otto's trunk was spotted in the Alley right next to that of Busta Rhymes. Who-HA! 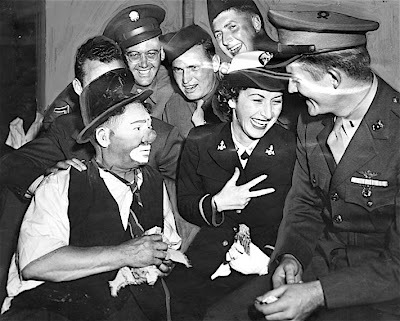 Otto (supporting the troops in his own fashion) seems smitten with Ensign Betty Bayly, October 2, 1943. Yo, dog! Circusbutterflygurl points out that Ensign Betty appears amused to the point of throwing down gang signs. DANG! 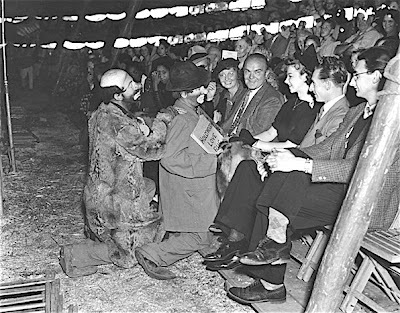 Once again making "moonsie-moonsie and tootsie-tootsie" by flashing his puppy dog eyes at a female fan in the seats in this photo dated September 27, 1937. Looking on are Hollywood stars Helen Broderick and Victor Moore. His partner looks, to me, to be Happy Kellams. Clips of both A. Robins and Sam Levine, the performers known to audiences as "The Banana Man". 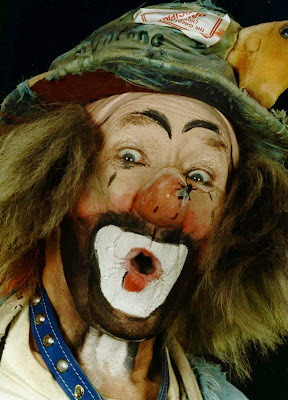 First up is a clip of A. Robins (although this is in dispute as Robins would have been 61 years old when this 1947 film was made 1947 and the performer seen here doesn't look a day older than the A. Robins seen in the 1939 Red Skelton short SEEING RED), originally known to vaudeville audiences as "The Walking Music Store" or "The One Man Music Store". 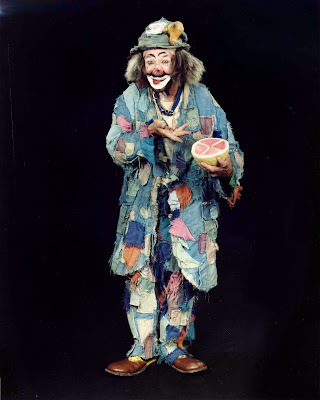 Robins, a talented NY area toy and prop maker as well as vaudeville and circus clown built all of his own props. Over time he added big bunches of his spring-loaded fruit to the enormous list of musical intruments he could load into his oversized coat, including (seemingly) hundreds and hundreds of bananas, hence the change in billing to "A. Robins: The Banana Man". Robins passed away in the early 50s. It is uncertain if he trained his successor, Sam Levine, personally or Mr. Levine was trained by their agent, Max Roach. Either way, Mr. Levine assumed the mantle of "The Banana Man" in the early 50s and kept Mr. Robins' unique brand of visual comedy alive on many, many television programs throughout the 50s, 60s and into the early 70s. He is probably best remembered for his numerous appearances on "Captain Kangaroo" throughout those years. The clip of Mr. Robins (or Mr. Robins' unknown immediate successor) is taken from the 1947 film MOTHER WORE TIGHTS. The clip of Mr. Levine is from late in his career and is believed to be from an early 70s (possibly his final) appearance on CAPTAIN KANGAROO. For more information on The Banana Man act and character, please click the title of this post to be taken to Rhett Bryson's excellent tribute page. 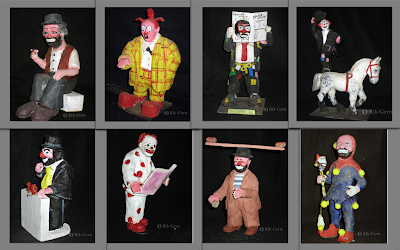 Just a few of the hundreds of highly detailed wooden figurines that Mark carved of some of his favorite clowns. Rik spent a weekend at the home of Wayne and Marty Scott photgraphing the figurines and other of Mark's work for a special project that he's working on as a tribute to one of his heroes. Some unused publicity photos of Mark, late in his career, that most likely haven't seen the light of day since the time that they were taken. 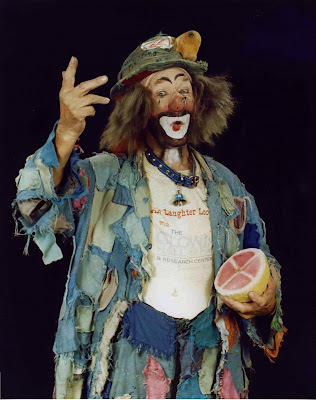 Mark's brief video bio from his induction among the first group of International Clown Hall of Fame honorees in 1989. 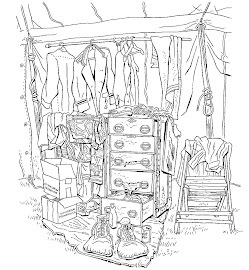 For more on the ICHoF please click the title of this post but be warned, the site hasn't been updated in quite some time and I don't believe that any of the email links are valid anymore. Alongside Pio Nock and Walter Galetti, Belgian born Linon is fondly remembered as one of the all time great wire-walking clowns. He is seen here performing on Hollywood Palace on December 26, 1967. The episode was hosted by Jimmy Durante (whom Linon doubled for in the film JUMBO) and Anissa Jones. 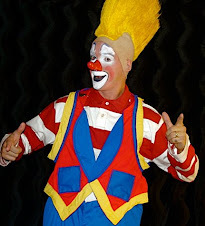 Legendary ex-Ringling clown Peter Pitofsky (Comic Strip Live, Tonight Show, Arsinio Hall Show, MADhattan, The Aristocrats) performing on Venice Beach. 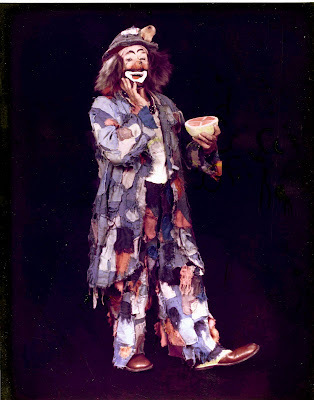 Peter can currently be seen (working alongside Pickle Family Circus alum Geoff Hoyle) in Seattle's Teatro Zin Zanni. To find more on the show please click the title of this post. Comedy Magician Ed Alonzo performs the classic Knife Thrower Gag. Please click the title of this post to visit Mr. Alonzo's website. 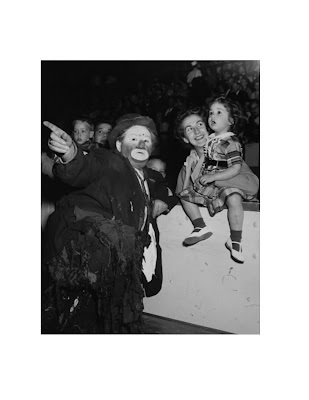 Otto Griebling makes his point to two year old Karen Nardironiant during a May 1960 performance of the Ringling Brothers and Barnum & Bailey Circus at the Boston Garden. From the A&E special UNDER THE BIG TOP, a look at some of contemporary American circus clowning's leading lights interviewed about their craft. More with Jason T. Stewart (Whiteface), Barry Lubin (Auguste) and Tom Dougherty (Character) and a great historical clip of Jack LeClair performing his "Blowing Up the Fat Man" gag.